What does the Old Testament say about polygamy? I have received the following comment about a post on polygamy. Sorry, but what I come to notice is that some people are using the New Testament to then try to interpret the Old Testament. Just like the author of this post is doing. By using Jesus and Paul interpretation of the Old Testament (Gen. 2:24-25) to say this means marriage is only between one men and one woman. If you see, in the Old Testament GOD never condemned polygamy for his people. It will be really hard for me to believe that GOD has clearly spoken and given rules about certain things like owning a Hebrew Slave, yet when it comes to polygamy he decides is best to put it a non-clear way. 1-“The first mention of polygamy in the Bible involves Lamech who claimed to avenge himself eleven times more often than Cain (Gen. 4:19, 24)”. -this point is moot, the text has to do with the killing, the fact that he had two wife makes no sense. If you find a person in the bible that was evil but only had one wife you will not say monogamy is bad. 2- “In fact, God had commanded that the king “must not take many wives, or his heart will be led astray” (Dt. 17:17)” – I love this because if you actually read the TEXT in CONTENT, well actually just read starting from verse 14, see that GOD is talking about the rules that the KING OF ISRAEL has to follow. He never ever say, everyone or my people. He is specially talking about the KING OF ISRAEL. 3- “The most extreme example of polygamy in the Bible is king Solomon who “had seven hundred wives of royal birth and three hundred concubines, and his wives led him astray” (1 Ki. 11:3). His wives turned him to idolatry.” – Again here, the passage clearly never say don’t have many wife’s because I say it should be only one men and one woman. It clearly teaches the wrong thing here is that the wife’s made him believe in ANOTHER GOD. This post is based on a survey of the instances of polygamy in the Old Testament (OT). I have been careful to identify instances of a man having more than one wife (or concubines) at the same time (concurrently). In those days woman sometimes died as a result of childbirth or for other reasons. In such cases the man usually remarried and could be said to have had children with two wives. Such serial marriages are not polygamy. We will see that because polygamy wasn’t God’s idea, it wasn’t the original form of marriage, and it wasn’t the ideal marriage assumed by the OT commands and it wasn’t the model for God’s relationship with the nation of Israel. In this post we look at whether the instances of polygamy (including bigamy) in the OT are a command, a model to follow or merely a report of events. Monogamy will be considered in the same way so the two can be compared. Is polygamy a command, a model or a report? Some think that Exodus 21: 7-11 regulates polygamy involving a female Hebrew slave. However the translation of “ownah” (Strong’s 5772, feminine noun) as “marital rights” in verse 10 is uncertain as this is its only occurrence in Scripture (NET Bible). Also, it has been suggested that it could mean accommodation or ointments. The main point is that the displaced woman was to be cared for and not disadvantaged. Therefore, this verse doesn’t definitely relate to polygamy. Hebrew law maintained the rights of the firstborn in a polygamous marriage (Dt. 21:15-17). Does this mean that God approved polygamy? Not necessarily, but He recognized that it did occur as this passage begins “If a man has two wives …”. It seems that God allowed polygamy because otherwise a man who had multiple wives would need to divorce all except one and those who were divorced would be destitute because they would be unable to remarry. Under Hebrew law, levirate marriage obligated a man whose brother has died and left a widow without heir to marry her (Dt. 25:5-10). The son of this union “shall carry on the name of the dead brother”. This special case preserved the family name and protected the family property and the widow’s welfare in societies where women can’t own property and there is no social welfare. If the man was already married, this would mean that he had two wives. This seems to be the only OT command that is potentially related to polygamy. The best Scriptural examples of levirate marriage are Tamar (Gen. 38:1-30) and Ruth (Ruth 3:1 – 4:17), but they don’t involve polygamy. Nathan the prophet said that God gave David Saul’s wives (2 Sam. 12:8). 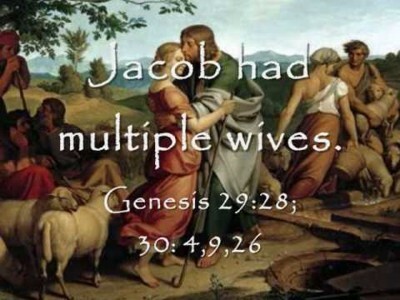 Does this mean that God commanded David to be polygamous? When we look at the context of this verse, it is part of the interpretation of the parable in v.1-4. The main message is that God has placed David as king of Israel in place of Saul. David has replaced Saul. So God had given David, as king of Israel, everything that was Saul’s. This included wealth and power and caring for Saul’s wives. If God had given him all this, how despicable of David to take another man’s wife. The Hebrew word translated “into your arms” (Strongs #2436) in v.8 is used in v.3 to describe how a poor man cared for a lamb like it was his daughter. Saul’s wives were given to David to care for like “all Israel and Judah” were given to him. But how could Saul’s wives trust him after how he had treated Uriah and Bathsheba? By the way, there is no conclusive evidence that he married any of them. So, this verse isn’t related to polygamy. It is interesting to note that Jehoiada (a good High Priest) chose two wives for King Joash (2 Chron. 24:3). Joash was a godly king until the death of Joash, but he didn’t finish well. Was this a model of bigamy to follow for the kings of Judah? Besides this, I am not aware of any example of polygamy in the OT that has God’s approval. In the following cases polygamy is reported as a historical event without being endorsed or criticised: Lamech (Gen. 4:19, 23), Nahor (Gen. 22:20-24), Abraham (Gen. 25:6; 1 Chron. 1:32), Esau (Gen. 26:34; 28:6-9), Jacob (Gen. 29:16-30), Eliphaz (Gen. 36:12, Caleb (1 Chron. 2:18-19, 46, 48 ), Manasseh (1 Chron. 7:14), Gideon (Jud. 8:30-31), and Elkanah (1 Sam. 1:1-2). Also, some other men who are said to have large numbers of children may have had more than one wife at once. But there are no reported incidences of polygamy among the Jews after the Babylonian exile in the 6th century BC. Polygamy is also reported amongst the following kings of Israel without being endorsed or criticised: Saul (2 Sam. 3:7), David (2 Sam. 5:13), Solomon (1 Ki. 11:1-8), Rehoboam (2 Chron. 11:18-21), Ahab (1 Ki. 20:3), Jehoiachin (2 Ki. 24:15), Jehoram (2 Chron. 21:14, 17), Abijah (2 Chron. 13:21), and Joash (2 Chron. 24:3). These kings disobeyed the command not to have many wives (Dt. 17:17). Solomon was the worst offender with 700 wives and 300 concubines! At that time kings used marriages to establish political alliances with other nations. For example, King Belshazzar (of Babylonia) had many wives and concubines and king Xerxes of Persia had a harem (Dan. 5:2; Est. 1:9; 2:14). The Bible says that polygamy led to troubles in the family. There was friction, jealousy and rivalry between the wives (Gen. 30:1; 1 Ki. 11:3-4). And Solomon’s wives “led him astray” and “turned his heart after other gods” (1 Ki. 11:3-4). So polygamy occurred in Old Testament times and it is reported amongst God’s people the Israelites, but it wasn’t approved or commanded by God. The only instance that could be a model for the kings of Judah to follow is the bigamy of king Joash. How does this compare with what the Old Testament says about monogamy? Is monogamy a command, a model or a report? The 10th commandment given to the Israelites includes, “You shall not covet your neighbour’s wife” (Ex. 20:17; Dt. 5:21NIV). The singular word “wife” assumes the ideal that each husband has only one wife. “… do not be unfaithful to the wife (singular) of your youth” (Mal. 2:15b). The singular word “wife” assumes the ideal that each husband has only one wife. “Do not have sexual relations with your father’s wife” (Lev. 18:8; 20:11; Dt. 22:30; 27:20). “Do not have sexual relations with your daughter-in-law. She is your son’s wife” (Lev. 18:15). “Do not have sexual relations with your brother’s wife” (Lev. 18:16; 20:21). “Do not take your wife’s sister as a rival wife and have sexual relations with her while your wife is living” (Lev.18:18). “Do not have sexual relations with your neighbor’s wife” (Lev. 18:20; 20:10). “These are the regulations the Lord gave Moses concerning relationships between a man and his wife” (Num. 30:16). “If a man is found sleeping with another man’s wife” (Dt. 22:22). “If two men are fighting and the wife of one of them comes to rescue her husband from his assailant” (Dt. 25:11). Also, the test for an unfaithful wife assumes the ideal of monogamy (Num. 5:11-31). In all these instances it is assumed that a husband had one wife at any given time and not more than one. “The king, moreover, must not acquire great numbers of horses for himself … He must not take many wives, or his heart will be led astray. He must not accumulate large amounts of silver and gold” (Dt. 17:16-7). Horses were used in warfare and royal wives were taken to form alliances with other nations. God wanted the kings of Israel to trust in Him and not in armaments or political alliances. The accumulation of wealth may be due to the oppression of the people. So God places limits on the armaments, alliances and wealth of these future kings. The kings “must not take many wives” (v.17). The Hebrew verb translated “many” (Strongs #7235) means multiply. This doesn’t seem to be a command for monogamy because in the previous verse the same word is applied to horses, which were used in warfare. As they wouldn’t be restricted to one horse, then they weren’t necessarily restricted to one wife. So this passage can’t be used to support monogamy for these kings. After God created Adam He said, “It is not good for the man to be alone. I will make a helper suitable for him” (Gen. 2:18). Note that the helper, which became Adam’s wife is singular, not plural. After God created Eve (the first woman) from Adam’s rib, the Bible says “That is why a man leaves his father and mother and is united to his wife, and they become one flesh” (Gen. 2:24). Because it says “that is why”, Adam and Eve are a model of marriage for humanity (when husband and wife leave their parents and live together). Because it says “his wife” and not “his wives”, this marriage is monogamous, with one man married to one woman and not many women. It is interesting to note that the second “start” to the human population (after the Genesis flood) began with four monogamous couples (Noah and his wife, Shem and his wife, Ham and his wife, Japheth and his wife). Also, Isaac, Joseph and Moses were monogamous. One of the blessings of a godly man is “Your wife (singular) will be like a fruitful vine within your house” (Ps. 128:3). King Solomon advised “Enjoy life with your wife (singular)” (Eccl. 9:9). Also, a godly man “does not defile his neighbor’s wife (singular)” (Ezek. 18:6, 15). Others who had one wife were Cain, Lot, servants (Ex. 21:3-5), Amram ( Num. 36:59), Lappidoth (Jud. 4:4), Heber (Jud. 4:17), Gilead (Jud. 11:2), Samson, Elimelek (Ruth 1:2), Phinehas (1 Sam. 4:19), Nabal (1 Sam. 25:3), David’s 600 men (1 Sam. 30:22), Uriah (2 Sam. 11:3), Bahurim (2 Sam. 17:18-19), a prophet (2 Ki. 4:1), Naaman (2 Ki. 5:2), Shallum (2 Ki. 22:14), Hezron (1 Chron. 2:24), Abishur ( 1 Chron. 2:29), Ephraim (1 Chron. 7:23), Jeiel (1 Chron. 8:29), Jehoiada (2 Chron. 22:11), Haman (Est. 5:10), Job (Job 2:9), Ezekiel (Ezek. 24:18). Kings have been omitted from this list because of the greater likelihood of them having more than one wife and of having concubines. For example, although Jezebel is said to be the wife of king Ahab, he also had other wives (1 Ki. 20:3; 21:5-7). When the men of Benjamin who survived war with the rest of Israel were provided with wives, it was one wife for each man (Jud. 21:20-23). So monogamy was the original form of human marriage (it was God’s idea) and it is assumed to be the ideal marriage in the commands of the Old Testament. Clearly monogamy was approved by God and was more prevalent in OT times than polygamy. It is interesting to note that the OT prophets often illustrated God as the husband of Israel (Is. 54:5-8; 62:5 Jer. 2:2; 3:14; Ezek. 16:32; Hos. 2:16, 19-20; 3:1). In this figure of speech, the nation of Israel is God’s wife. It only makes sense with monogamy and not with polygamy – God only had one bride and wife in the OT and that was the nation of Israel. God didn’t have multiple brides and wives in the OT. Because of her idolatry (following other God’s), Israel is accused of spiritual adultery (Jer. 3:1, 20; 13:27; Ezek. 23:37; Hos. 1:2; 4:13-14; 5:4; 9:1). Israel had broken the covenant between them (it was like a marriage covenant). This is illustrated by Hosea who married Gomer in a monogamous relationship (Hosea only had one wife). But Gomer was unfaithful in committing adultery – “like an adulterous wife this land (the northern kingdom of Israel) is guilty of unfaithfulness to the Lord” (Hos. 1:2). Afterwards Hosea took her back. He was to “love her as the Lord loves the Israelites” (Hos. 3:1). Then he told her “You are to live with me many days; you must not be a prostitute or be intimate with any (other) man, and I will behave the same way toward you” (Hos. 3:3). This is a monogamous marriage, not a polygamous one. So the model for God’s relationship with the nation of Israel was a monogamous marriage and not a polygamous one. We have seen that monogamy was approved and commanded by God, but polygamy wasn’t. Monogamy was God’s idea. But God protected the rights of children in a polygamous marriage and protected women without an heir. Also the commands given in the OT assume monogamous marriages, and not polygamous ones. The first marriage was between Adam and Eve, so it was monogamous. Also the marriages of those saved in the Genesis flood to repopulate the earth were monogamous. So marriage was monogamous at the beginning of time and not polygamous. The godly example and model for marriage in the OT was monogamy. Although some godly men were polygamous, they aren’t commended for their polygamy. Instead the Bible records the troubles that this caused (see the lives of David’s and Solomon’s children). The only model to follow that advocates polygamy, may be that the bigamy of king Josiah was a model for the kings of Judah. 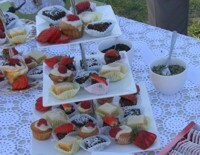 Both monogamy and polygamy are reported in the OT without being endorsed or criticised. These are historical reports of events that don’t indicate God’s viewpoint on the subject of marriage. Because monogamy was God’s idea, it was the original form of marriage, and it was the ideal marriage assumed by the OT commands and it was the model for God’s relationship with the nation of Israel. Because polygamy wasn’t God’s idea, it wasn’t the original form of marriage, and it wasn’t the ideal marriage assumed by the OT commands and it wasn’t the model for God’s relationship with the nation of Israel. This entry was posted on August 22, 2015 by George Hawke. It was filed under Christian, Old Testament, Spiritual and was tagged with bible, bigamy, concubine, David, marriage, monogamy, polygamy, Solomon, wives.